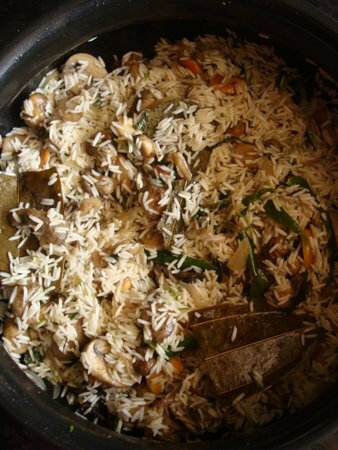 Mushroom pulao is a simple, easy to make, veg rice dish that is very fragrant and flavorful. An Indian style rice preparation that’s aromatic due to the use of Indian basmati rice, mint leaves and Indian spices like cinnamon and nutmeg. It makes for a perfect dinner meal or lunchbox with a side like raita or korma. 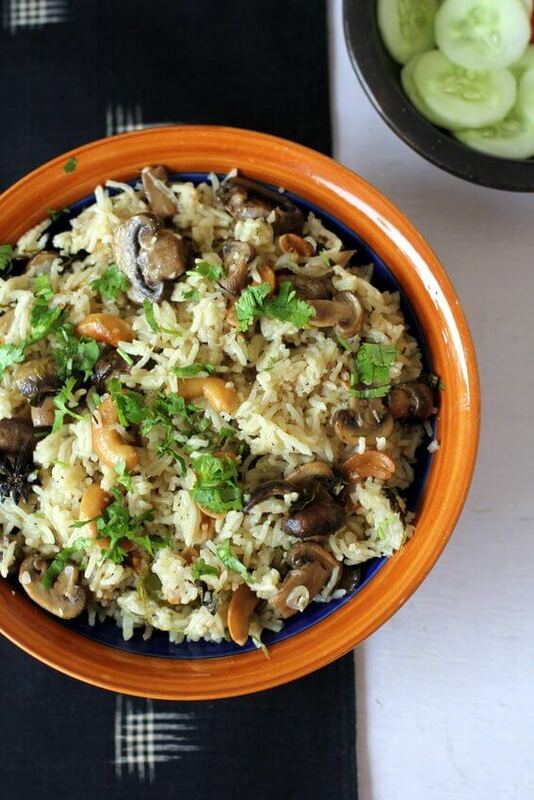 Mushroom, a source of meatless vegetarian protein lends a robust earthy flavor to the pulao. A super quick one pot meal with minimal preparation, minimal ingredients, and the use of a pressure cooker. Clarified butter or desi ghee and roasted cashew nuts make a huge difference as they elevate the flavor of this otherwise humble dish. 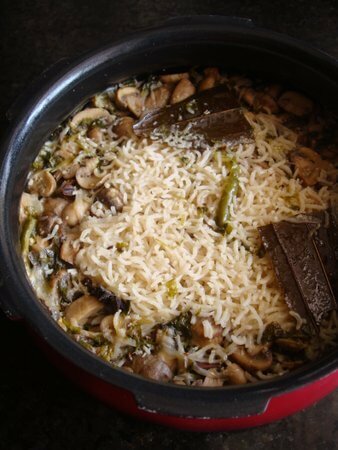 An easy mushroom pulao recipe in a pressure cooker with step by step instructions that can be prepared by even beginner cooks with ease. I have prepared the pulao in a pressure cooker. You can make the pulao in a cooking vessel or a rice cooker too. 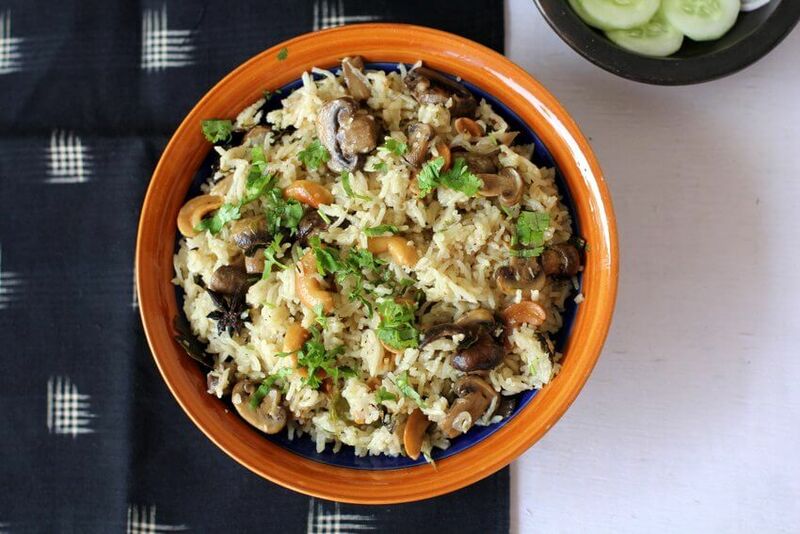 Mushroom pulao ingredients include mushrooms, basmati rice or any long grained rice, sliced onions, green chilies, chopped fresh mint, coriander leaves, ginger garlic paste, yogurt or coconut milk and cashew nuts. 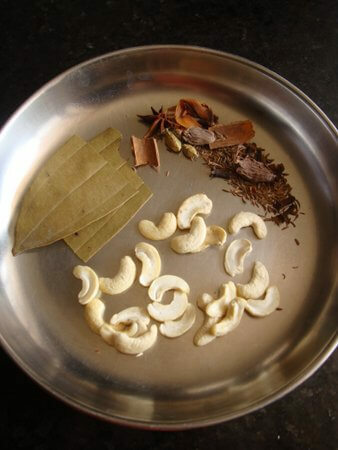 The spices that go into the making of mushroom pulao recipe are cloves, cinnamon, star anise, mace, nutmeg powder, black cardamom, green cardamom and bay leaf. 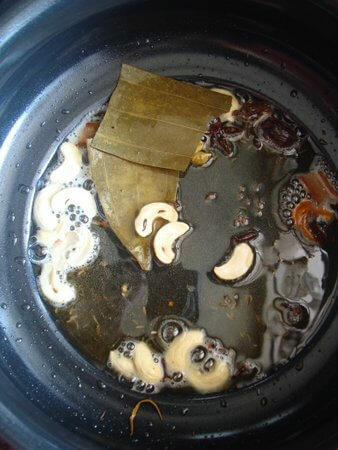 Once oil and ghee or butter turn hot in a pressure cooker, the bay leaf, the spices, and cashew nuts are tipped into the cooker. 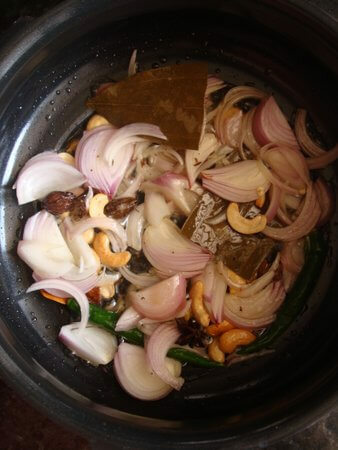 Once the cashew nuts turn golden brown, the sliced onions and green chilies are tipped into the cooker and sauteed till the onions turn pink. Next ginger garlic paste is added and sauteed till the raw flavor of the ginger garlic paste disappears. 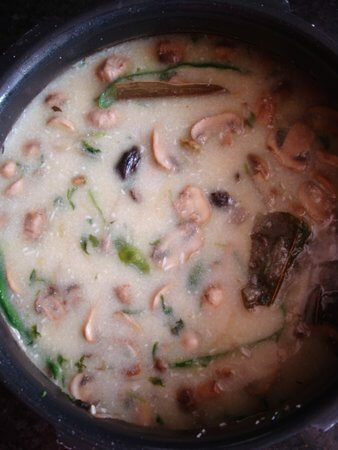 The sliced mushrooms along with fresh mint and coriander leaves are tipped into the pressure cooker. 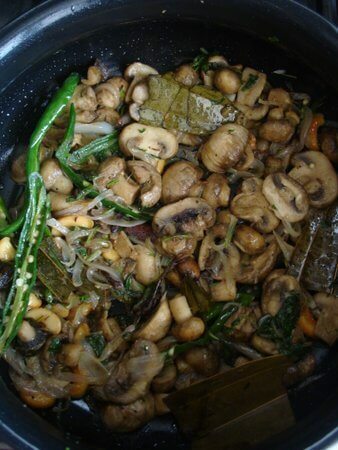 We have to ensure that the mushrooms are well sauteed and change color as shown in the image. Next, basmati rice that has been soaked in water for 15 min and drained is tipped into the pressure cooker. The rice has to be carefully mixed to combine without breaking the grains. Next, yogurt and salt are added and mixed. Vegans can use coconut milk instead of yogurt. 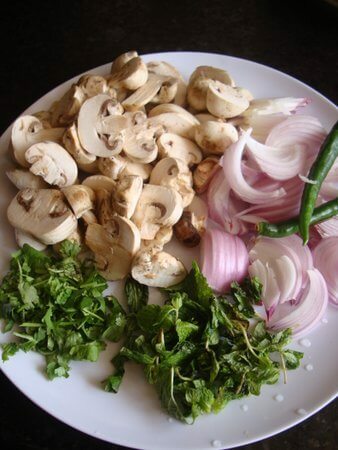 Since mushrooms leave some water, reduce the quantity of water used to cook the mushroom pulao. I usually add 2 cups of hot water for 1 cup of rice. While making mushroom pulao, I add 1 3/4 cups water for 1 cup of rice. If using thick coconut milk, use 1/4 cup coconut milk and 1 1/2 cups water. Pressure cook up to 3 whistles and turn off heat. Allow the pressure to ease and open the lid. Fluff up the rice lightly and remove to a serving bowl and garnish with fresh coriander leaves. 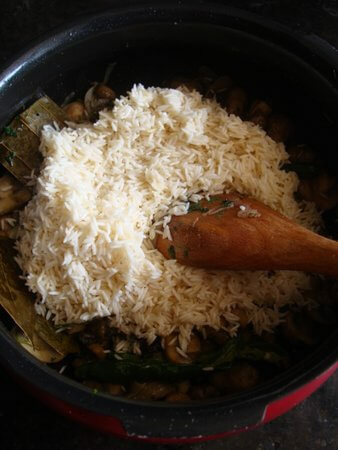 If you do not have basmati rice on hand, you can use any long grained rice for this mushroom rice dish. I’d suggest you use fresh mint leaves and dash of nutmeg powder which adds oodles of flavor and aroma to the pulao. 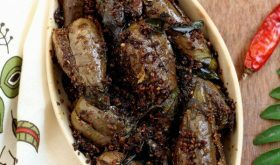 The flavors are perfectly balanced with a hint of spice from the green chilis and a robust earthy taste of the mushrooms. 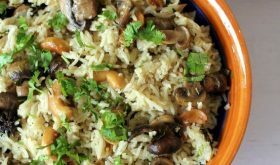 If you’re not a mushroom fan yet, you will be after you have tasted this aromatic veg Indian rice preparation with mushrooms that is a gem among Indian mushroom recipes. Heat ghee and oil in a pressure cooker. Add shah jeera, bay leaf, cinnamon, cloves, green cardamom, black cardamom, star anise mace, nutmeg and stir for a few seconds. 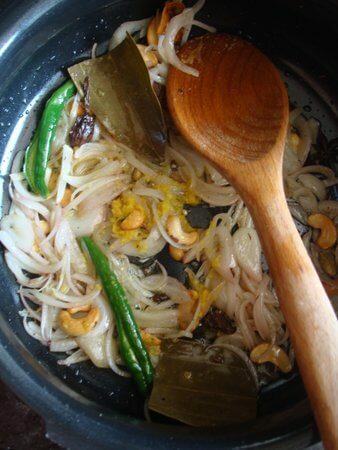 Add the cashew nuts and saute till they turn golden. Add the sliced onions and slit green chilis and saute for 5 mins. Add the ginger-garlic paste and saute for 4 mins till the raw smell disappears. 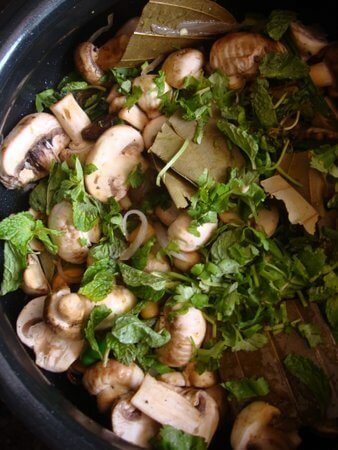 Add the coriander and mint leaves and saute for 2-3 mins. Add the sliced mushroom and cook for 7-8 mins. Add the drained basmati rice and carefully mix. Saute for a min and add the yogurt OR coconut milk. Mix well. Add water, place the lid and pressure cook up to 2 whistles on medium flame. Turn off heat. Once the pressure has eased, remove the lid and lightly fluff up the rice with a fork. Remove to a serving vessel and garnish with fresh coriander leaves. Serve warm with raita or korma. 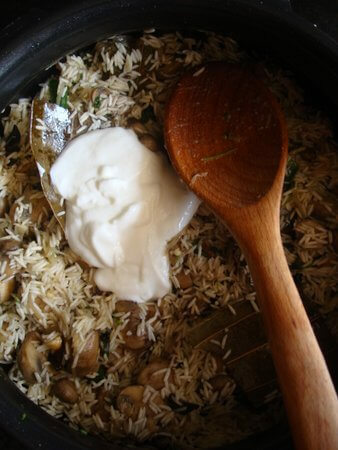 If using normal everyday rice instead of basmati rice, use a little less than 2 cups water for 1 cup rice. Vegans can omit ghee and yogurt and use coconut milk instead. If cooking the pulao in a cooking vessel, follow the same procedure till Step 4. Bring the rice to a boil, reduce flame to low-medium heat, place lid and cook for 18-20 mins. Do not remove lid for 10-12 mins after turning off heat. You have ginger/garlic paste in the instructions, but not listed in the ingredient list. How much would you suggest we add – 1-2 tsp? This looks absolutely delicious! Thanks so much for sharing. I tried mushroom pulao today. It turned out really yummy. Thank u for sharing the recipe. Many more to try from the list soon.